For many kids with disabilities, playing Little League baseball or recreational soccer isn't always an option. But one local organization is giving them the opportunity to be active, gain confidence and make lifelong friendships. WASHINGTON — Five years ago, Yonina Fairley was fighting for her life. She was 17 and on her way to recovery after spinal surgery when something went horribly wrong. She coded and spent 26 scary days in the intensive care unit. “She left us and came back,” said Adrienne Fairley, Yonina’s mother. 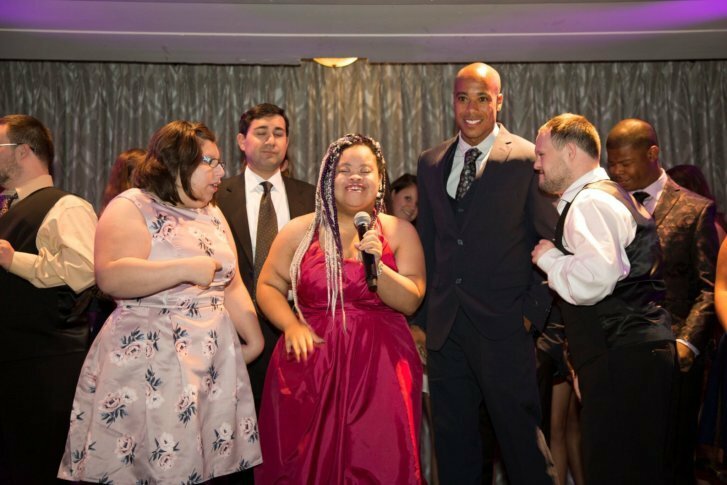 KEEN is a volunteer-led nonprofit that offers free sports and recreational programs to children and young adults with physical and developmental disabilities in the D.C. region. But for Yonina and her mother, the organization is so much more than an opportunity to play a game of basketball or take a swimming lesson. For them, KEEN is community. Yonina Fairley, 22, has been involved in KEEN for more than a decade. Lately, Zumba is her favorite activity. She loves to dance and perform. Yonina is on stage at the organization’s 25th anniversary. Yonina, now 22, has been involved with KEEN for more than a decade. Over the years, she’s tried her hand at track, basketball, canoeing and Zumba — her current favorite. More importantly, she’s formed lifelong friendships with other athletes and volunteers. “It is difficult and it is isolating when you have a child who is said to have special needs because they don’t get a chance to do some of the activities that other typical kids get to do,” said Adrienne, a D.C. native. It also promotes physical activity — a necessity for children with disabilities. Research shows that children with developmental disabilities are at greater risk for obesity than their peers. “Part of that is because they tend not to have the opportunities to exercise. They don’t have Little League; they don’t have the kinds of programs that most kids have … and so they tend to be at home; they tend to be more isolated,” Braverman said. In Yonina’s case, low muscle tone, an effect of Down Syndrome, makes it difficult to stay fit. “She’s active; she dances; she does amazing things. However, the weight tends to just want to stay there, so KEEN has made a huge difference in her, physically,” Adrienne said. In 25 years, KEEN has grown from five children in a Montgomery County middle school gym to more than 500 children at 15 locations throughout D.C., Maryland and Virginia. All 30 programs offered for those ages 5 to 25 are free. “Of course, families with children with disabilities face numerous challenges and one of those is economic. It’s very costly to find programs; there are medical costs; there are therapy costs,” said Braverman, adding that KEEN relies on a small staff, a large volunteer base (more than 15,000 teens and adults have volunteered) and fundraising to keep things running. Braverman said many of the young participants come into the program a little “timid and fearful,” but that quickly changes once they start interacting with each other and with the volunteers. Adrienne said these days, one of Yonina’s favorite things is being on stage and performing, and KEEN has helped foster the confidence to do that. “She feels accepted and valued by the KEEN family. And that almost supersedes the exercise, and the exercise is phenomenal and absolute,” said Adrienne, who schedules her weekends around KEEN activities. In December 2017, Yonina faced another scare that almost took her life: a massive blood clot that forced her back into the hospital. But already, she’s back at Zumba. “I don’t care what I have to do; we have to get to KEEN. That’s been a part of our lifestyle. It’s made a huge difference,” Adrienne said.